Traveler, there is no path, the path is made by walking. By walking, the path is made and when you look back. You’ll see a road never to be trodden again. 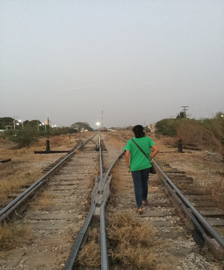 Diego, not his real name, arrived at the Hermanos en el Camino (Brothers in the Road) Migrant Shelter in Ixtepec, Oaxaca fleeing from gang violence and death. He grew up in a poverty stricken home abandoned by his father. And so at a very early age he was determined to find a way to survive and help out his mother. His hard work and sacrifices doing meager jobs led him to learn how to drive skillfully around different tourist spots that eventually enabled him to save up money to build a simple house his family could proudly call their own. As his story unfolded, sadness and pain became evident as he recounted how his modest achievements as a teenager became a source of envy by many and in particular by a notorious gang who wanted him to be part of their group. And so they began to threaten him to give in to them or else, trouble and even death would await him and his family. But he refused to submit to them and would beg for more time before he would make a decision. It was his unwavering faith in God as a sacristan and his love for his mother who constantly reminded him never to have blood in his hands in exchange for money, prestige or power that gave him the needed strength to resist the pressures of the gangsters who relentlessly pursued him until the day came when hiding from them was almost impossible. The journey of a thousand miles begins with a single step. (Lao Tzu) And so, it happened one dark night when he suddenly heard boisterous noise approaching his home. Instinct made him rush out of his house at the back door and climbed the treetop. As soon as the gangsters left because they could not find him, he immediately bade goodbye to his beloved mother and neighbors. He left everything behind without looking back, everything that meant the world to him not knowing if he will ever have the chance to see and embrace his mother again. He sneaked out of the country crossing the borders of Guatemala on his way to Mexico with another good and trusted companion whom he fondly called Tío. Together they braved the unknown and weathered all kinds of dangers and hardships along the way including extortionists who divested them of whatever little money they had left in their pockets. They experienced hunger, thirst and fatigue as they walked on foot, their documents soaked wet and destroyed while they crossed rivers and ate all the fruits they saw hanging on the trees along the wayside. They slept under the stars and at times were lucky enough to find a roof over their heads in remote villages where kindhearted persons welcomed total strangers like them to stay for the night. As days passed uncounted, neither did the road ahead seem to lead somewhere in the vast and barren landscapes beyond the frontiers of Mexico. And while their strength and stamina were wearing out, it is then when angels in disguise appeared to catch them at the right moment when they were almost about to give up. 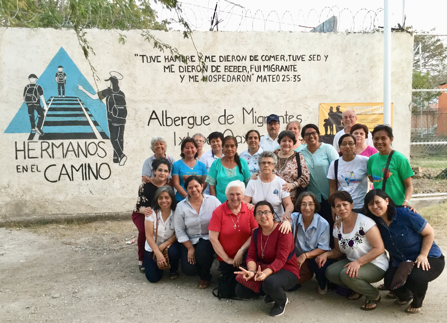 They guided them to an oasis in the desert, to the railroad tracks leading to Ixtepec where the Hermanos en el Camino Migrant Shelter founded by Fr. Alejandro Solalinde Guerra in the Year 2007 is located. 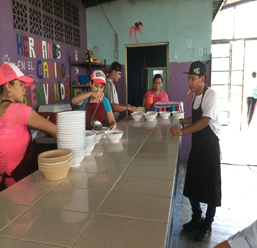 The place has been providing humanitarian aid (food, shelter, medical, psychological, and legal help) to migrants from Central America, as well as South America, Asia, and Africa with the community of the Guardian Angel Sisters and volunteer staffs working round the clock. More than 400 migrants sought refuge at the shelter on the first night. Since then, the flow of people has been constant. Diego’s face lighted up as he recalled the day he entered the gates of the shelter as if he found a new home, a new family welcoming him to come, rest and recover. It’s been nine months now since he arrived at the shelter and it has meant all the difference in his life until now. He has gradually transitioned to become one of the volunteer staffs happily helping out in the kitchen serving meals and doing whatever kind of service for the countless migrants who come in and out of the center to seek refuge for a time being before they move on to their final destination wherever their hopes and dreams would take them. But for young Diego, he has found a renewed sense of purpose and meaning in his life serving at the center and making it a better place where everyone feels welcomed and treated with compassion, respect and dignity. Tears flowed from my eyes as he humbly ended his story. In contrast, his eyes lit with indescribable joy, gratitude and contentment welling deep down in his heart for the new leash on life given him. Hope is restored once again and new life springs eternal in this barren wastelands. The inspiring story of Diego as well as the disturbing testimonies of two mothers with their children marked the beginning of the Lenten season for me. Time and again, God invites us to look into our lives and see the shattered pieces of our broken selves and to recognize that we contribute to the chaos and disarray in the world around us. We are called to undertake once more that inner journey towards a real conversion of heart in order to bring our lives back into the path of true peace and harmony with our selves, with others and with God. I know I contribute to the chaos and sin of the world sometimes, even inadvertently by my indifference and lack of solidarity. My wrestling with my own demons and inconsistencies in my vowed life makes me reflect on God’s desire for a world in right relationship and my work to create that kind of shalom. God was in the desert with Jesus as he was sorely tempted for forty days and nights, and in our own “desert” stirring, God most undoubtedly dwells deeply with us. 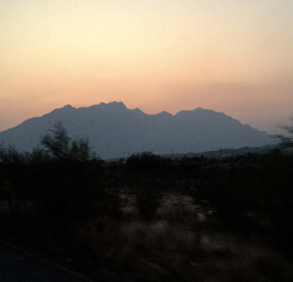 I learned that the name “Ixtepec” is derived from Nahuatl and roughly translates to either “view of the mountain” or “face of the mountain. True enough, gazing at the breathtaking view of the mountain was like being transfixed into seeing the face of God etched at the crimson horizon. But what was even more surprising was to discover an amazing natural pool of cool clear spring water flowing at the foothills where I was blessed to take a refreshing dip one hot afternoon along with my fellow sisters and the Guardian Angel Lay Family (FLAG) participants prior to our three days workshop-encounter on the topic of Migration and Human Trafficking in this side of the world. And so as I return here to my place of mission in Nicaragua, I realized that my dry well has been unknowingly filled to the brim in that oasis in the desert. The God of life certainly has a way of surprising me in ways beyond my imagination. I am blessed and I am called anew to walk the roadless travelled path of transformation of the heart with a deeper commitment for our migrant brothers and sisters in search for a life where justice, peace, human dignity and harmony reigns supreme. Marjorie Guingona, SAC – is a Filipina and member of the Guardian Angel Sisters Congregation, who is currently assigned in Nicaragua.